Dedicated to providing ubiquitous trust across the ecosystem, the CryptoManager platform includes a Security Engine, which is a flexible root-of-trust implemented as hardware or software, for the secure provisioning, configuration, keying and authentication throughout the lifecycle of a device. The CryptoManager Security Engine is an in-device root-of-trust offered as an embedded hardware core, or as a software agent that can be implemented as a protected element in a trusted OS or directly in the high-level device OS for the secure provisioning of keys and features throughout the device lifecycle. This provides flexible implementation options and allows the CryptoManager Infrastructure to securely communicate with the device to provision keys and manage feature configurations in the supply chain and downstream ecosystems. 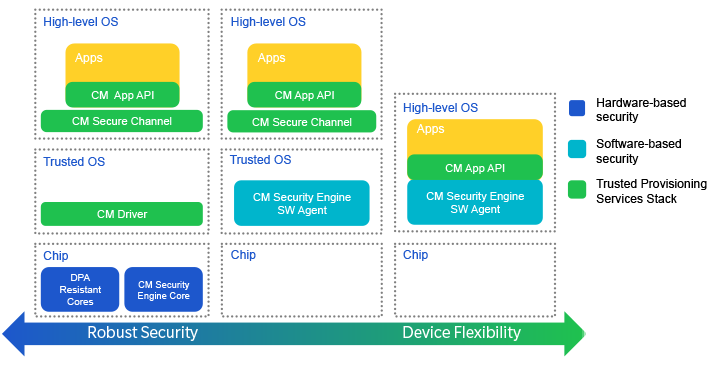 The Security Engine hardware core is suitable for integration in application processors, modems, and other chipsets and features flexible design options that enable functionality, area, and power to be optimized for the required security level. This ensures maximum trust with minimal design impact. The core stores and protects sensitive key and configuration information in One Time Programmable (OTP) memory in the SoC. For feature management, the core manages rights delegation and feature activation based on permission settings. Embedded root-of-trust enables trust to be established early in the manufacturing process, providing ongoing security and trust management throughout the lifecycle of the device. Portfolio of on-device software and drivers for seamless integration with CryptoManager secure provisioning and on-device application security services across a wide range of devices.